To get started in the application process, there are a few preliminary items that need to be completed if you haven't done so already. (1) Form a Board of Directors–The board of directors is the governing body of a nonprofit organization. The responsibilities of the board include discussing and voting on the highest priority issues, setting organizational policies, and selecting and managing your coaching staff. Board members are not required to know everything about nonprofit management, but they are expected to act prudently and in the best interests of the organization. They approve operating budgets, establish long-term plans, and carry out fundraising activities. KNPUSA recommends a board of at least 3 non-related members: President, Secretary, and a Treasurer. (2) Choose Entity's Legal Status–You can apply for 501(c)(3) status either as a corporation or as an unincorporated association. Please review our FAQ section for more information in regards to the benefits of incorporating. (3) Obtain a Federal Employer Identification Number (FEIN or EIN)–To open one or more bank accounts in the name of the organization (and to file Form 990 with the IRS after each fiscal year), you will need to obtain an EIN. This number will also serve as the identification number that you will give to donors for tax deduction purposes. The EIN is your organization’s equivalent to an individual’s Social Security Number. Despite the name, every organization needs an EIN regardless as to whether or not they have employees. (4) Create Articles of Association/Bylaws–If your organization doesn’t have an Articles of Association/Bylaws document, we encourage you to have KNPUSA create it so that you are assured that your document contains all of the 501(c)(3) elements required by the IRS. The official formation date of your organization is either (a) the date that your organization was incorporated or (b) if not incorporated, the date that your board of directors adopted your Articles of Association. 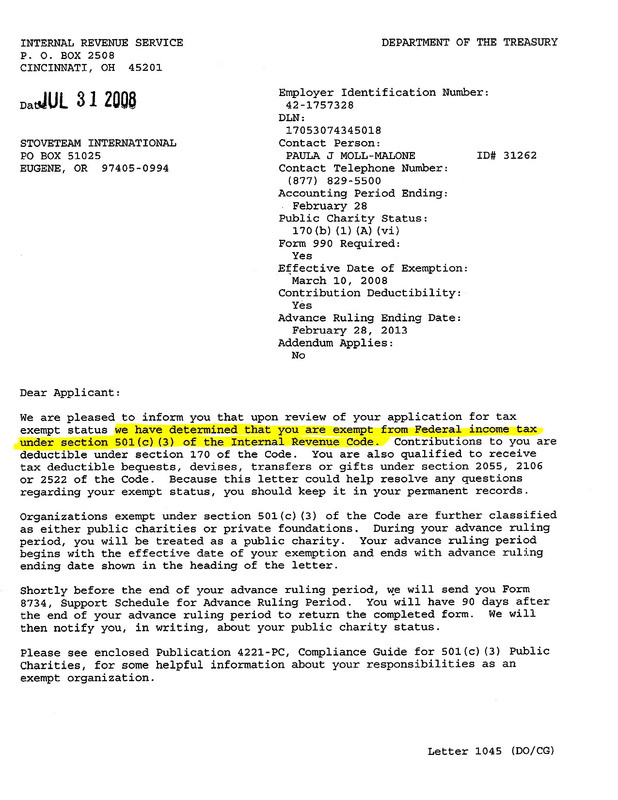 The IRS has imposed a deadline of 27 months from your formation date to file for 501(c)(3) status. Filing within this 27-month period is retroactive to your formation date. If your organization is beyond the 27-month timeframe, then your effective date for 501(c)(3) status is the date that the application is filed with the IRS. To avoid paying penalties and back taxes for the period that your organization was not tax exempt, you must also file for 501(c)(4) status, which is retroactive to your original formation date. The primary difference between (c)(3) status and (c)(4) status is that donations made to 501(c)(4) organizations are not tax deductible to the donor. Organizations that are older than 27-months must utilize both KNPUSA's 501(c)(3) and 501(c)(4) Application Services. When you're ready to get started, you need to order a service package and any additional services by clicking here. Once your order is received and processed, KNPUSA will email you instructions and questionnaire(s) comprised of both general questions about your organization as well as in depth financial information required by the IRS. The questionnaire is Microsoft Word-based and can be completed electronically. We will provide you with sample responses to the various questionnaire questions to help you formulate your responses. Once completed, simply e-mail the file back to us. Once we receive the completed questionnaire, our staff will assemble the actual application package. During this process, we may need to speak with you to acquire additional information. Also at this point, we will send you several forms that require original signatures from your organization's officers. When all of this is complete, we will mail the application package to the IRS. Once approved, you will receive a Determination Letter from the IRS, which is your official notice of your federal tax exempt status. Upon federal tax exempt certification, KNPUSA will then file a tax exempt application with your state (if applicable). Our approval rate track record is 100%. This is attributed to both our streamlined application processes and our extensive first-hand familiarity with the IRS’ evaluation criteria. If for any reason we do not feel that you will be approved as a 501(c)(3), then we will advise you of that prior to processing your order. If we file your application with the IRS and you are not approved, then we will refund all of our fees. In addition, the IRS will refund the application fee. Essentially, our service is 100% risk-free.